Boy, this kid is fearless. Actually, I'm not sure Kahlei Stone-Kelly from Australia is even old enough to be called a kid. He's just a baby. 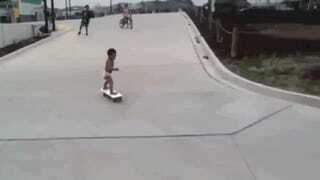 A two-year-old toddler in diapers who's already better at skateboarding that many full grown human adults. Just look at him go and display excellent balance, a little bit of trickery and a whole 'lotta cool as he glides on that board. Kahlei has been skateboarding since he was six months old and is basically a little prodigy. He doesn't nail every trick perfectly but whenever he falls he simply picks himself back up and tries again. It's incredible to see a young kid never give up or cry. You can see Kahlei skate more on his Facebook page here.